We are delighted to confirm the addition of MICHAEL MESSER’S MITRA to the bill of Farmer Phil’s Festival 2019. 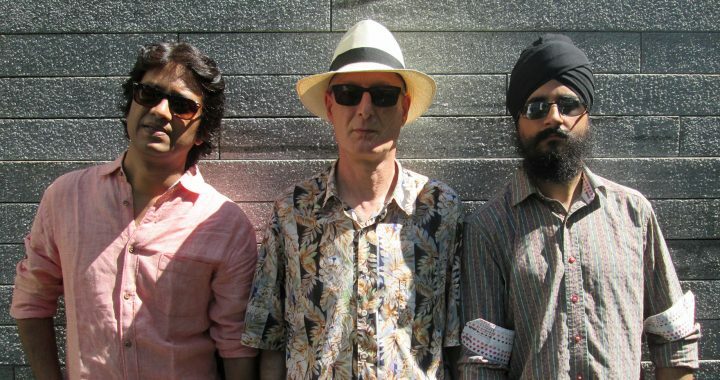 Mitra (pronounced ‘meetra’) is a trio comprising British blues innovator and slide guitarist, Michael Messer, Hindustani slide guitar maestro from India, Manish Pingle, and London-based table master, Gurdain Singh Rayatt. This is more than another meeting of musicians from different cultures, this is a band with a successful album and its own unique sound – an exhilarating and highly accessible fusion of blues and Hindustani classical music. With vocals, slide guitars and tabla, these three musicians from opposite sides of the globe create their own amazing unique music. The album, ‘Call Of The Blues’, released in 2016 was immediately picked up by the blues, world and folk media, getting worldwide airplay and press coverage in more than 40 countries, and hitting #1 in the iTunes blues chart. Michael Messer’s Mitra have done six successful UK tours, including shows at London’s Bush Hall, Musicport, Shambala, and many other festivals. “MAGNIFICENT INDIAN BLUES… ‘Call Of The Blues’ is a remarkable fusion of country blues with Hindustani music, showcasing the splendour of the slide guitar and the talent of three extraordinary musicians”. “…Not since the Beatles teamed up with Ravi Shankar back in the day has there been such an experimental and inspired meeting of musical cultures. I’ve no doubt this album is going to be internationally lauded for both its musicianship and Messer’s stunning vision”. “The trio spent two days in the studio recording this quite superb album. Messer’s regular blues repertoire is the source of much of the material – but they’re transformed by the Indian musicians, as the dark, droning mojo of the Delta is lent additional mystery by the layers of raga-like atmospheric ambience. Best of all is ‘Bhupali Blues’, in which the exchange works in the opposite direction, with Messer’s bottleneck blues tropes blending seamlessly into the structure of a traditional raga as the two guitarists exchange licks with scintillating panache”. “There’s nothing I like more than a meeting of musical minds where you can’t hear the joins, and that is absolutely what we’ve got here. Messer is rare amongst Brit bluesniks, in that he possesses a real feel for the music and yet gives it his own personal stamp. This is an acoustic blues album that takes the music right back to the deltas; Mississippi and Ganges”. Posted in Line-up News and tagged 2019, artists, Michael Messer's Mitra.